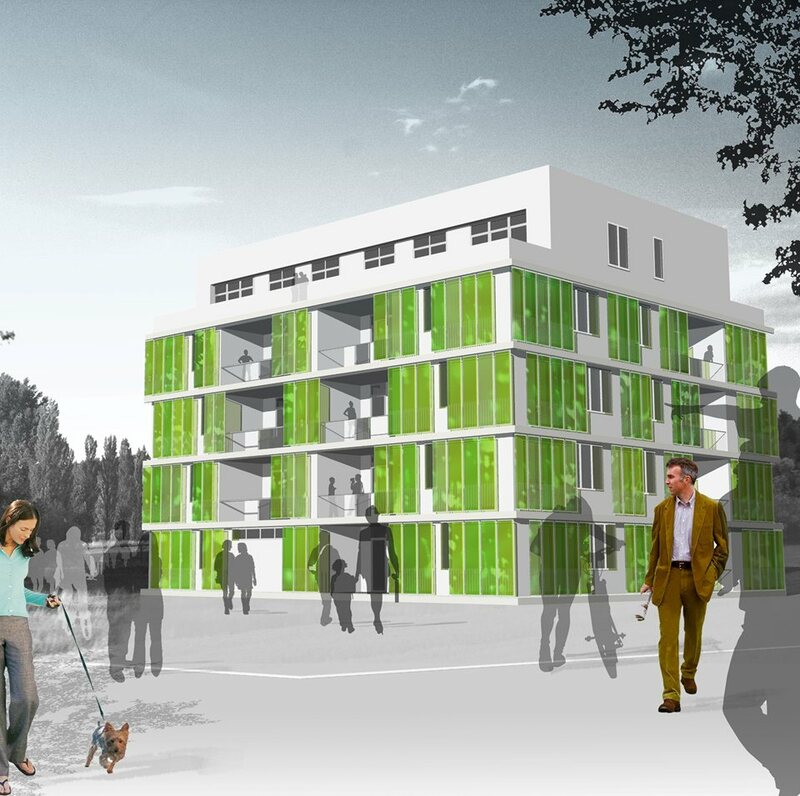 A zero-energy house under construction in Germany is set to provide the first real-life test for a new façade system that uses live microalgae to provide shade and generate renewable energy at the same time. The world’s first ‘bio-adaptive façade’ will be installed in the ‘BIQ’ house for the International Building Exhibition (IBA) in Hamburg, which runs through 2013. The façade concept is designed so that algae in the bio-reactor façades grow faster in bright sunlight to provide more internal shading. The ‘bio-reactors’ not only produce biomass that can subsequently be harvested, but they also capture solar thermal heat – both energy sources can be used to power the building. In practice, this means that photosynthesis is driving a dynamic response to the amount of solar shading required, while the micro-algae growing in the glass louvres provide a clean source of renewable energy. The shading louvres for the BIQ house in Hamburg are being fabricated in Germany by Colt International on the basis of bio-reactor concept and design work led by the international design consultant, Arup, in cooperation with SSC Strategic Science Consult of Germany. The BIQ house was designed for the IBA exhibition by Splitterwerk Architects of Graz, Austria. Arup’s Europe research leader, Jan Wurm, said, “To use bio-chemical processes for adaptive shading is a really innovative and sustainable solution so it is great to see it being tested in a real-life scenario.